Quality entertainment that doesn’t take itself too seriously. Mutated Mediocre Public Television Galactic Defenders Save the Universe! Toenail Fairy Tales: The Smelly Sequel! Secrets, secrets… Christmas secrets, that is! Who decorated the Orson’s Folly City Hall with thousands of lights? Who’s the Secret Santa leaving presents all over town? And who’s sneaking out to the barn at three in the morning fetching even more gifts? Justin McGee might have been able to resist, but with Christmas closing in, his sons Ryan and Sean are off in Jackson on ranch business, leaving Sandy and Mel to worry about their husbands with a major snowstorm brewing. 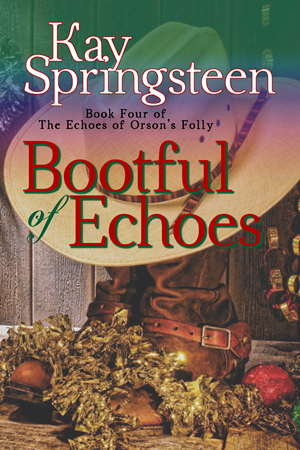 Justin sets out to keep their spirits up… and finds himself contemplating a second chance at love when his childhood friend Charlotte Hains, abandoned by her own adult daughters, comes to spend the holidays with the McGees. Will all the secrets and surprises work out right? Will everyone make it home for the big day? Who’s got the best memory of a Christmas past? And will Justin ever bring himself to pull that little square box out of his pocket long enough to pop the question?